Fall in east is one of the most beautiful sights on earth. The leaves are on fire and the cool air reminds me that it is almost time to break out my ski boots again and see if I can remember what I am doing on snow. 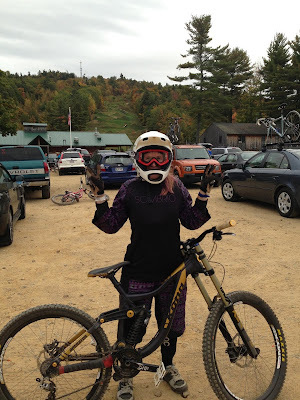 It is also the time of year when I start driving down to Highlands Mountain Bike Park in New Hampshire to give my downhill bike a little bit of a workout. Downhilling on the east coast is a blast, but it can be extremely uncomfortable in the summer when the humidity is through the roof and the temperature is around 95 degrees. Wearing a full-face helmet in that kind of weather is less than enjoyable. In late fall, however, body armor provides extra warmth and Downhilling becomes a far more pleasurable activity. I also came prepared with my Mammut Jungfrau T-shirt as an anti-chaffing underlayer to keep me the perfect temperature and my Pike Jacket which is quite possibly my favorite layer for warmth in the entire world. Downhill Biking is the perfect sport to get my mind into gear for ski season as it hones my line choosing ability, strength, and agility, not to mention my courage. If I can fly through the air on a huge DH bike then I most certainly should not be worried about doing the same with just a couple of sticks strapped to my feet. In October, Highlands hosts a women’s downhilling clinic, which I decided would be a good way to meet other women who enjoy punishing gravity sports and an opportunity to hone some of my skills on dirt. 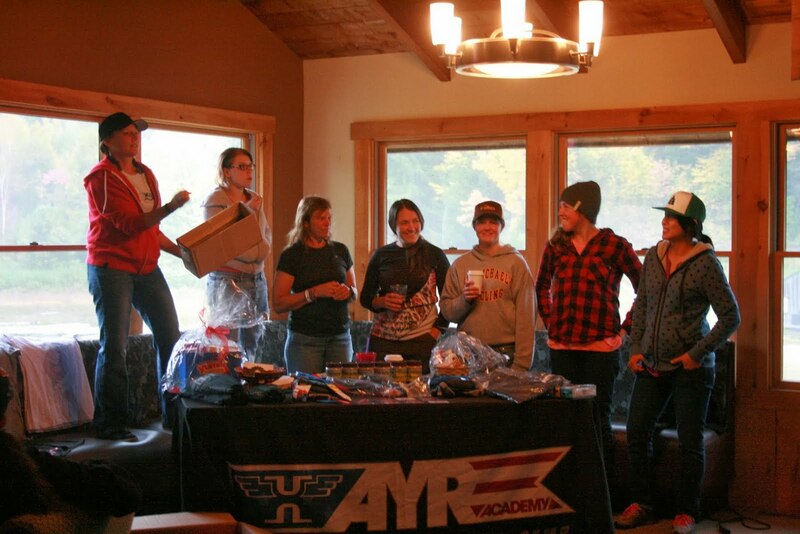 The camp, hosted by Highland Mountain Bike Park in conjunction with SheJumps, allows for women of all ability levels to explore a genre of biking that is often inaccessible to women. I saw this as a great opportunity to send it into the Red Bull Ayr Bag, which I had never done before, and work on the beginnings of my in-air trick repertoire. Let’s just say I am still a ways off from throwing a back flip, but I had fun nonetheless. Aside from my time spent jumping into a giant inflatable pillow, I pushed my progression on the beautifully flowy trails that Highlands has to offer and hung out with some pretty amazing chicks. When I was not biking I traveled into the quaint town of Tilton NH and decided to partake in the local fare at the Tilt’n Diner where they had Jimmy Buffet playing far too early in the morning for that kind of cheery attitude and waitresses that pride themselves on being surly and aggressive. While the coffee was a little watery, the eggs and hash were the perfect start to my second DH day. All in all it was a great fall adventure and I plan on heading back down as soon as possible so that I can fly through the air and get as close to that feeling of weightlessness as I can while still abiding by the laws of gravity.